Concern among the governors of the Four Corners states over federal recovery plans for the Mexican wolf has prompted the Colorado Parks and Wildlife Commission to look at again weighing in on the issue of wolves more generally. The agency on Friday considered a draft resolution that would reaffirm positions taken in the 1980s in which it opposed the reintroduction of wolves — and for that matter, grizzly bears — into the state because of concerns about impacts to livestock, wildlife and human welfare. However, it put off any action until later, in part to consider ensuring that it’s also consistent with the recommendations made by a Wolf Working Group and adopted by the commission in 2005. The group called for allowing wolves to migrate into the state and came up with a management plan should that occur. The commission’s revisiting of the wolf issue inspired an angry email from working group member Gary Wockner to reporters this week, objecting to the draft resolution it considered Friday. “This sneaky resolution is a 100 percent violation of the agreement of the Colorado Wolf Working Group,” Wockner wrote. But Parks and Wildlife spokesman Matt Robbins said wildlife commissioners on Friday, particularly William Kane of Basalt, asked to have the proposed resolution reworded to better reflect the thoughts of the working group. 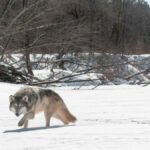 The commission is looking again at the wolf issue as a result of a letter sent by Gov. John Hickenlooper and his counterparts in Utah, Arizona and New Mexico to Interior Secretary Sally Jewell and U.S. Fish and Wildlife Service Director Daniel Ashe on Nov. 13. “We have serious concerns with the Service’s planned approach to recovery plan development” for the Mexican wolf, the governors said. The agency in January issued a final rule listing the Mexican wolf as an endangered subspecies under the Endangered Species Act. The governors wrote that they “do not support recovery of the Mexican wolf across regions and landscapes that are not part of the subspecies’ historical range.” They added that available science doesn’t suggest the animal historically lived north of Interstate 40, which runs through Arizona and New Mexico. The governors went on to say the Fish and Wildlife Service is mistakenly planning to discuss population objectives before even considering where Mexican wolves will be established, and has wrongly created a panel filled with scientists with an agenda of establishing Mexican wolves north of I-40. The governors also called for a recovery plan with a focus on Mexico, home to 90 percent of the Mexican wolf’s historic range. Robbins said Colorado Parks and Wildlife’s discussion Friday was prompted by the idea of passing a resolution in support of the governors’ letter. The draft resolution the commission discussed points to the positions the then-Colorado Wildlife Commission took in 1982 and 1989 in opposition to reintroduction of wolves. The draft acknowledges the existing plan regarding how wolves “will be managed and tolerated” should they migrate here, but also reiterates concerns about potential impacts to livestock and big game should reintroduction occur. That latter language incensed Wockner, who holds a doctorate degree specializing in wolf management. In an interview, he said it insinuates the 14-member working group opposed reintroduction of wolves, which wasn’t the case. Bray couldn’t be reached for comment Friday, but Robbins said Bray did respond Friday to the criticisms raised. “He said he wasn’t backing off of the (working group) decisions and that he does support those decisions and those points that were made in that working group back then,” Robbins said. Robbins said it appears the commission simply is looking to reaffirm its past position on wolves. But Wockner believes a position that continues to oppose reintroduction of wolves and only leaves open the door for natural migration of the animals guarantees the animals never will live in Colorado. He cited what he called the failure of the Mexican wolf recovery program to date, and said that with the removal of the gray wolf from the federal threatened and endangered species list, Wyoming is now letting the animal be shot if it wanders beyond a buffer surrounding Yellowstone National Park. So while a few wolves have made it to Colorado on their own in the past, the shoot-on-sight policy makes it unlikely they’ll ever make it here again, he said. However, Robbins noted that a gray wolf made it to the Kremmling area this year before being mistakenly shot by a coyote hunter. Wockner said wolves belong in Colorado. “They were here first, for starters; they have a rightful place on the landscape,” he said. He pointed to the documented role they have played in improving ecosystems in the Yellowstone area, such as by keeping elk and deer from lingering and eating all the vegetation near streams. Most of the West is public land, but its management has been politically controlled by the livestock industry, he said. “If the public wants wolves on its public property the public should have the right to see them out there,” he said. good info. Wockner is our of touch with reality. Colorado now has 5.4 million residents. In 2050, expected to be 7.7 million. Can 10 million be far behind. Hardly room for man or beast, let alone, a wolf pack.